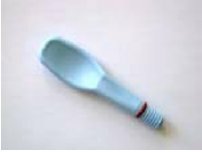 Z-Vibe spoon tip for feeding. Similar to our regular spoon tip but this tip is made of "softer" material. The tips are constructed of medical grade materials that are FDA approved and contains no Latex.